Our online Ohio teen drivers education course is the latest and greatest way to learn the rules of the road and earn your license. This isn't an online version of a dry, boring classroom course slapped together and thrown on a website. It's a thousand times better. We've carefully designed a superior learning experience for you, then perfected it with interactive case studies, quizzes, and videos to help you learn more effectively. And with 24/7 online access, you can study on any device, even your smartphone. So what are you waiting for? You can sign up once you're at least 15 years and 5 months old. (If you're 17 and 12 months or older, you are not eligible for this course.) Get started now. If you're under 18, you must take a BMV-approved Ohio drivers ed course. Next, you'll need to pass both a written permit test and a vision screening and must hold your temporary permit for at least 6 months before pursuing a drivers license. 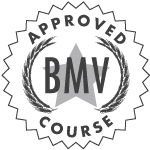 To qualify for a BMV driving test, you must finish 8 hours of instructor-led behind-the-wheel, along with 50 hours of supervised driving practice. Passing the driving test earns you a drivers license. Note: You must be at least 15 years and 5 months old to start taking a drivers ed course and at least 16 to take your driving test. If you're under 18, you're required to take a drivers education course to earn your license. Our new BMV-approved online course (LIC. #1420) is your best option for Ohio teen drivers ed. We cover the same information as classroom-based courses, except we do it in an exciting and interesting way! You can start taking Ohio teen drivers ed once you're 15 years and 5 months old—sign up now to begin! Earning your license is fun, simple, and convenient with Ohio teen drivers education online. Unlike all the rigid classroom alternatives, our flexible online course puts you in fully in control of the learning process. With unlimited access to the course from any Internet-connected mobile, tablet, or desktop, you get to choose and when and where you study. Your progress is automatically saved, so you don't lose your place. And with all the material right at your fingertips, you don't have to worry about missing a thing. You can always return to the course to review as much as you like. Find Ohio drivers ed in your city! Before you can get behind the wheel, you have to pass a BMV written permit test. Our Ohio teen drivers ed course covers everything you need to know for the test and more. You'll even get 50 free practice BMV permit tests to help you prepare. You're sure to pass with DriversEd.com. Our interactive and engaging lessons help you understand and remember the material. You'll learn all about current traffic laws and important driving topics from our multimedia course, with 3-D animated case studies, movies, quizzes, and more. At the end of the course, you'll have three chances to pass the official final test, provided by the Ohio BMV. Once you pass, we'll send you a BMV-accepted Certificate of Completion that proves you've completed your Ohio teen drivers education requirements. Ohio law requires teens under 18 to complete 8 hours of in-car drivers training. After you complete the first 2 hours of our drivers education course, you'll receive a Certificate of Enrollment. You can take this certificate, along with your Ohio instruction permit, to any Ohio driving school to start your driving lessons. Find an approved driving school here. With DriversEd.com, you can rest assured you'll be ready for the driver's seat. We've been teaching drivers ed for over 25 years, and we're experts on traffic safety. Our Ohio drivers education course covers the knowledge you need to prevent and handle dangerous situations when you get behind the wheel. Get started on the process of earning your license now—sign up for online drivers ed! Our Ohio teen drivers education course prepares you for a lifetime of safe driving. Statistics show that teens who complete formal drivers education are safer, better drivers with fewer crashes, traffic convictions, and license suspensions. DriversEd.com courses have even been proven to reduce traffic violations and DUIs. Several studies show that online courses are just as effective as traditional classroom courses. In fact, we think you'll find our online courses to be even better. Get ready to become a safe, smart, and responsible driver: start your drivers education with us today.